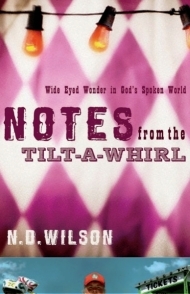 Notes From the Tilt-A-Whirl: Wide-Eyed Wonder in God’s Spoken World (DVD) is a cinematic treatment of a worldview. A poet live in concert. A motion picture sermon. VH1 Storytellers meets Planet Earth. 60 Minutes meets Sinners in the Hands of an Angry God. In this unusual but fascinating film sequence, best-selling author N.D. Wilson gives an emotional and intellectual tour of life in this world and the final chapter that is death. Everything before and after and in between is a series of miracles–some of which are encouraging, others disturbing and uncomfortable. About the Author(s): Nathan David Wilson enjoys high winds, milk, and night-time. He received his master’s degree from Saint John’s College in Annapolis, Maryland, is the managing editor of Credenda/Agenda magazine and is also a Fellow of Literature at New Saint Andrews College. He married a salt-water girl and is happiest when adventuring with their small pack of offspring. He is the author of three novels for children and countless bedtime stories. His short writing has appeared in Books & Culture, The Chattahoochee Review, and Esquire.